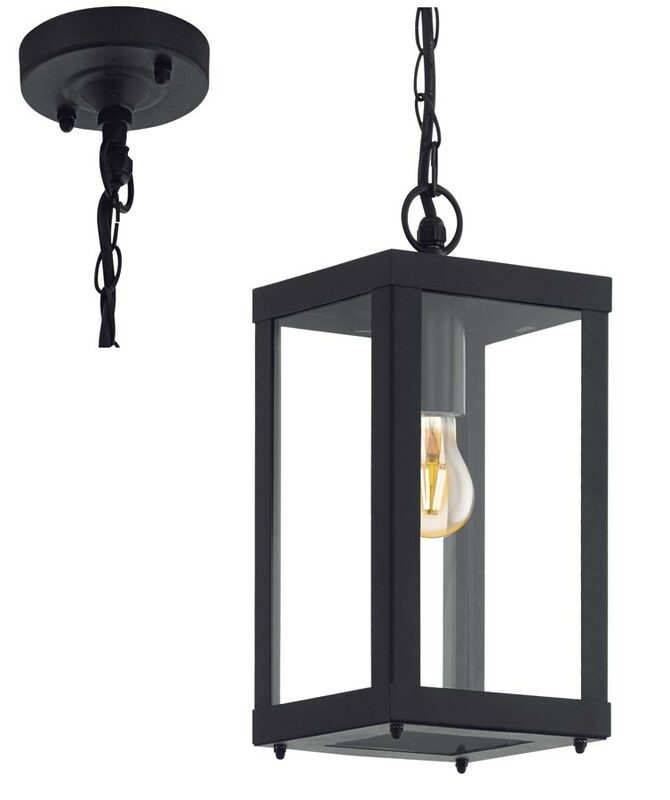 The Alamonte 1 black finish, square hanging outdoor porch lantern is rated IP44 and classically styled with a contemporary twist. Square profile lantern and clear glass panels suspended from chain link suspension and circular ceiling mount. Shown here fitted with a filament LED lamp that is not supplied but can be purchased separately by following this link. This is a tough hanging outdoor box lantern constructed from black finish hot galvanised steel, with clear glass panels that will give many years service. Height adjustable at the time of installation by shortening the chain, please see the technical data below for further information. There are matching fittings in the black Alamonte 1 outdoor lighting range, please see below. The height of the box part of this lantern is 275mm, the minimum drop without any chain is measured at 400mm.